For the U.S. men and women who set the track world on fire last summer, the road from Rio de Janeiro to London passes directly through Sacramento. The Brazilian coastal city was the site of the 2016 Olympic Games, where the United States collected 32 medals in track and field, nearly triple the number of the second-strongest nation. London is the site of the 2017 IAAF World Championships. To get to London, U.S. athletes must punch their tickets at the 2017 USATF Outdoor Championships, to be held June 22-25 at Sacramento State. For most, it means finishing in the top three of their events at Hornet Stadium. For a select few who have wild-card selections to the World Championships, they’re still required to show up and compete in Sacramento. In other words, the field of nearly 1,000 athletes in Sacramento will be the strongest assembled in Sacramento since the 2004 U.S. Olympic Track & Field Trials. In fact, two of the biggest names expected in Sacramento this summer had their coming-out parties at those 2004 Olympic Trials – sprinters Allyson Felix and Justin Gatlin. Overall, though, the current elite of U.S. track trends much younger than Gatlin, 35, and Felix, 31. Brenda Rollins, the 100-meter hurdles winner in Rio de Janeiro, is 25. Olympic shot put champion Ryan Crouser is 24. Keni Harrison, the 100-meter hurdler who failed to qualify for the U.S. Olympic team but broke the 28-year-old world record two weeks later by clocking 12.20 seconds in London, is just 24. Combine the veterans and the up-and-comers with a deep pool of experienced competitors in the late 20s and it’s safe to say that the momentum from the 2016 Olympics should carry over into the post-Olympic year. The Junior Championships will be held in conjunction with the main event. NBC will provide live coverage from 1 to 3 p.m. on Saturday, June 24, and Sunday, June 25. Harrison was the clear Olympic favorite until she stumbled to a sixth-place finish at the Olympic Trials. No matter: Rollins, Nia Ali and Kristi Carlin finished 1-2-3 in Rio de Janeiro, the first-ever Olympic sweep in U.S. women’s track and field. 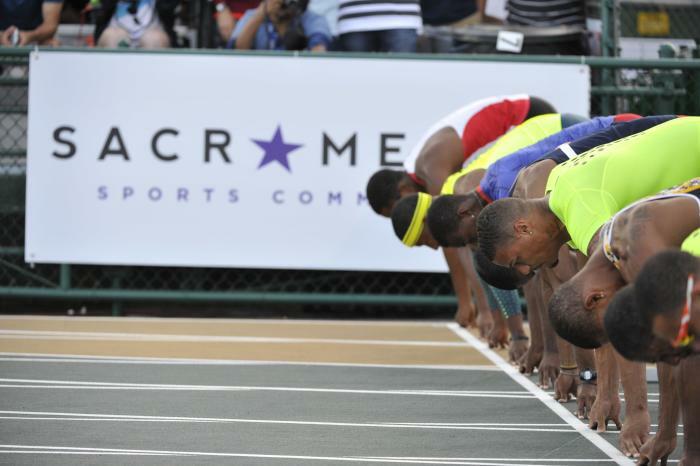 With warm weather and a fast track, the world record could be threatened in Sacramento. Harrison (12.20) and Rollins (12.26) rank first and equal-fourth on the all-time list. Devon Allen was a two-sport standout at Oregon who recently gave up football to run track professionally. 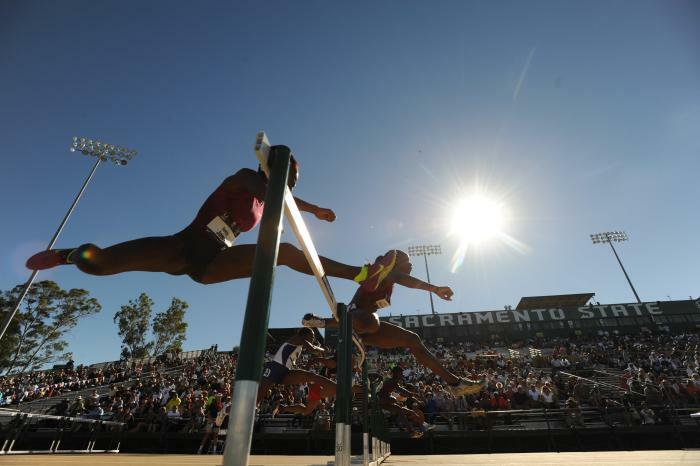 Allen won the 110-meter high hurdles at the 2014 USATF Championships in Sacramento and placed fifth in the Olympics. In the 400-meter hurdles, Kerron Clement and Dalilah Muhammad won the men’s and women’s gold medals in Brazil. Sacramento fans may recall Clement’s win at the 2005 NCAA Championships back in 2005. Sacramento crowds love the sprints, and this should be an interesting year. Usain Bolt of Jamaica has lorded over the sprints for the last decade, but he says this will be his final season. Gatlin has been Bolt’s main challenger over the last several years and remains the top American sprinter until someone proves otherwise. Trayvon Bromell is up and down, but he gave Gatlin a run for his money at the Olympic Trials and is just 21 years old. Despite being shut out of the medals in Brazil, U.S. hopes in the men’s 200 meters are bright with Noah Lyles and Michael Norman. Weeks after graduating from high school, Lyles and Norman placed fourth and fifth at the Olympic Trials. Lyles skipped college to turn professional; Norman is a freshman at USC. Tori Bowie emerged as the top U.S. female sprinter in 2016, winning three medals at the Olympics, including a gold in the 4x100 relay. English Gardner won the Olympic Trials in 10.74, making her the seventh-fastest sprinter in history. Felix, the 2012 Olympic champion at 200 meters, won three medals in Rio de Janeiro, giving her nine Olympic medals for her career, the most in U.S. women’s track history. It remains to be seen whether she’ll defend her 2015 world title in the 400 or contest the 200 instead. Former Oregon standout Matt Centrowitz became the first U.S. male to win the Olympic 1,500 meters in 108 years when his 50.5-second last lap in Rio de Janeiro brought him the gold medal. Centrowitz doesn’t run super-fast times on the European circuit, but he’s an extraordinary big-meet runner with a great finishing kick. In the women’s 1,500, Olympic bronze medalist Jenny Simpson and Shannon Rowbury, the U.S. record holder at 3:56.29, will renew their fierce rivalry unless Rowbury chooses to run the 5,000 instead. This marks the first time that the U.S. has the reigning men’s and women’s Olympic shot putters. Crouser broke the Olympic record by throwing 73 feet, 10 ¾ inches in Rio, and Michelle Carter became the first American woman to win the Olympics with a national-record 67-8¼. Carter, the daughter of former San Francisco 49ers great Michael Carter, won the Capitol Shot at the 2014 nationals in Sacramento. Joe Kovacs won the men’s Capitol Shot in 2014 and claimed the silver medal in Rio. Just as Sacramento will showcase the Olympic gold medalists in the shot, the same holds true in the long jump. Jeff Henderson and Tianna Bartoletta won the men’s and women’s long jump in Rio, Bartoletta winning a stirring duel with the 2012 Olympic champion, Brittney Reese. The pole vault is always one of the most popular events, and there should plenty to cheer in Sacramento. Sam Kendricks won Olympic bronze in the men’s vault, and Sandi Morris claimed silver in the women’s event before becoming just the third woman to clear 5 meters (16-4¾) in a post-Olympic meet. Jenn Suhr, the 2012 Olympic champion, has also exceeded 5 meters. Kate Grace’s career took off last year when she moved to Sacramento to train with the NorCal Distance Project. Grace won the 800 meters at the Olympic Trials and reached the Olympic final in Brazil. 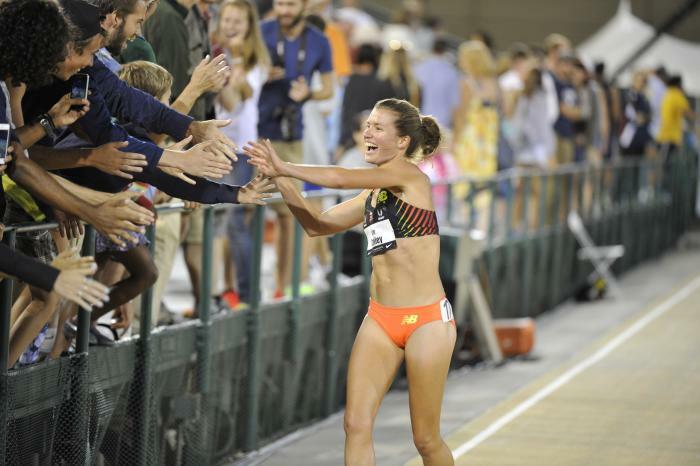 Grace’s training partner, Kim Conley, qualified for her second Olympic team in the 5,000 meters. Stephanie Brown-Trafton of Galt put off retirement after narrowly missing out on her fourth Olympic team in the discus. Brown-Trafton won an Olympic gold medal in 2008.